For the last 7 days or so I have been a fitness gadget fanatic 🙂 that’s what it felt like anyway, with my oh so loyal Fuelband on my right wrist, and my recently won Up band by Jawbone on left wrist. 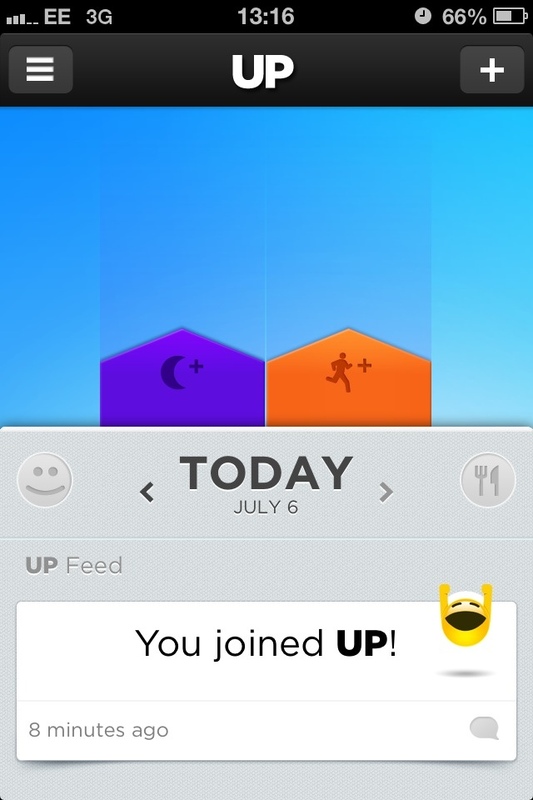 I won the Up via #TheEveryDayActive challenges run by Zico coconut water here in London. I don’t know about you, but my knowledge of the Up was limited and it seems yours may be too as when I scanned my friends lists via the iPhone app it seems I have no friends who own one that I can compete or share this journey with. 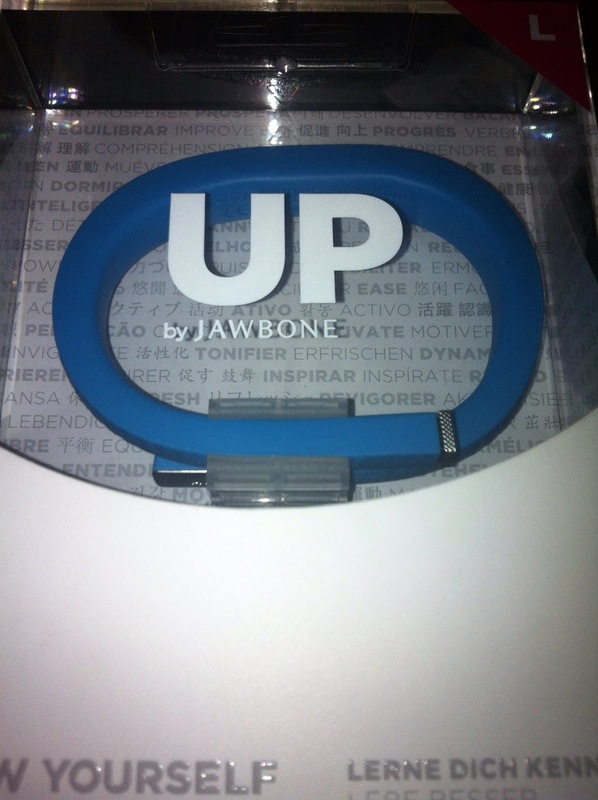 Nike Fuelband 1 point…Up…nil points! 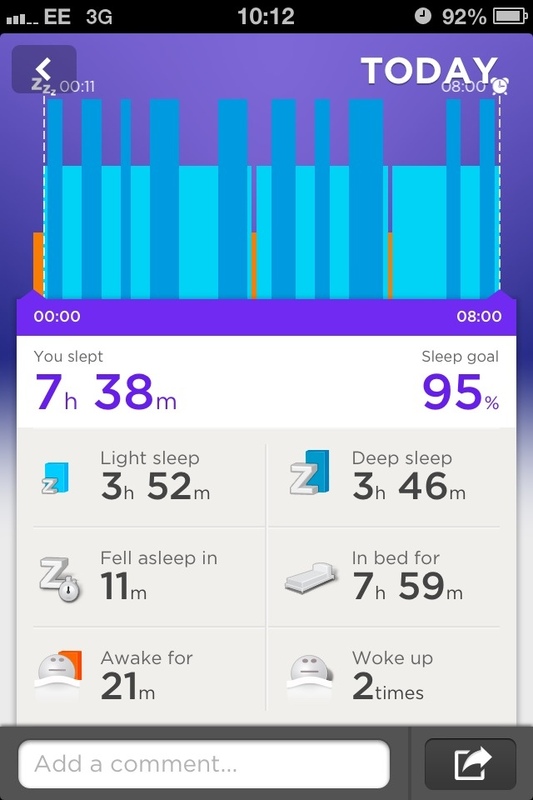 Up: like the fuelband, it is a wristband and app that tracks how you sleep, move and eat – then helps you to use that information to feel your best. It measures your movement using steps, and also contains the option of a food diary. NFB: this device measures your moves and turns them into NikeFuel. It also measures your steps each day and calculates calories burned. 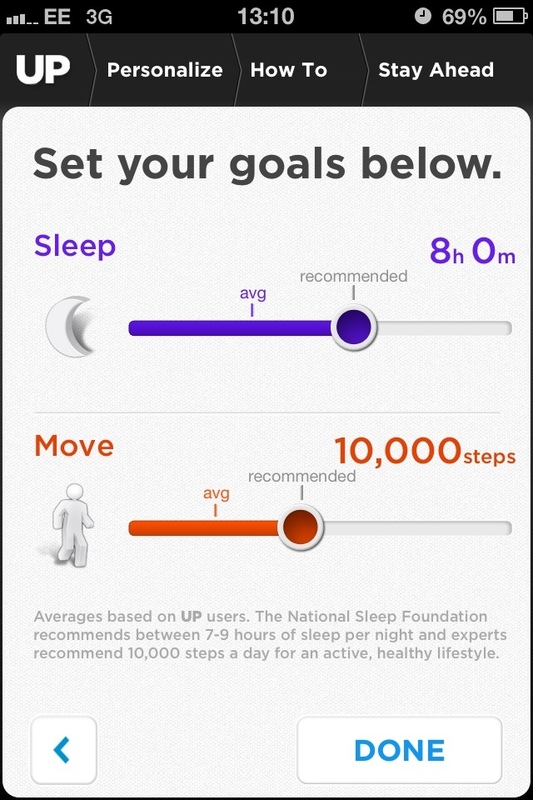 Up: you can set a goal for the amount of steps you are aiming for in a day (I set mine at the recommended 10,000) and for the amount of sleep you would like to get each night (I set mine for 8 hours per night). NFB: you set a goal for the amount of NikeFuel you want to earn each day (I set mine at 3,000 which is described as an active day). Tell me about the armband itself…y’know…is it pretty?! Up: the one I have is blue, you know I would choose pink if I could 🙂 It’s not unattractive at all, but it is kinda unique looking…just like a bracelet. The battery should last 10 days when fully charged depending on how often you sync (which is via the headphone socket on my phone). It has one button discreetly on the end and the plug bit has a cover which hides and protects at the same time. There are two symbols which light up when the button is pressed – a sun and a moon. It is splashproof by the way…not waterproof so no swimming! NFB: I currently have the white ice (I previously had the original matt black) although it is a shade of grey / brown since being on my wrist for 4 months! The battery lasts a long time…can’t remember how long exactly but probably on par with the Up. Useful that when the battery is low it does tell you via the display. It has one button which lights up said display – feature a series of lights which start of red and end in green depending on how far you have progressed towards reaching your goal for the day. The USB connection is hidden in the closure of the band so is also well protected. The NFB is also just splash proof and you sync via bluetooth. Up: the app is great 🙂 really sleek and easy to navigate. From the app you can sync your armband to see your progress towards your goals, view helpful tips to help you meet your goals, connect to other apps such as MyFitnessPal or Runkeeper and even set alarms! NFB: after the recent update the app has been way more friendly. It has lots of graphs and leaderboards to get the ol’ competitive spirit going huh!? When you meet your goal, the little digital guy, Fuelie comes to give you a shout out 🙂 I know he is not real, but he is cute and a little motivating! Up: yup. Because the band measure your sleep you can set it to wake you up…at an optimum time for your body. It does so by vibrating lightly which so far has been successful for me every time! It wakes you up in a window of time which means it chooses when you are in a light sleep which is better for your body! Up: you can hook up to MyFitnessPal, Runkeeper and a host of other health apps which I haven’t even heard of. You can also share your results via Facebook and Twitter. Not quite sure why it hooks up to the first two though as it seems none of the information transfers over…so if I enter my food in one, I have to do it in the other…sound pointless to you?! NFB: you can hook up to Facebook, Twitter and Path where you can share your results and shout outs (y’know, like when you smash your daily goal say by 50%). 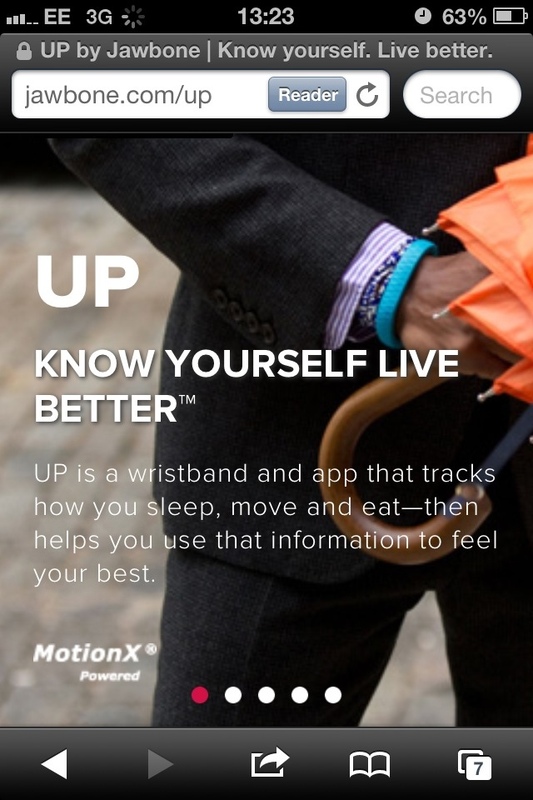 Up: extras include a stopwatch, idle alert for when you sit still too long, power nap to ensure you don’t sleep too long and you can also log your exercise in a day. NFB: it tells the time! Believe me this has come in useful quite a number of times! So, what is your overall verdict?! Up: Love it! But as someone who well knows the benefits of being active and exercise I think it may not be aimed at me. NFB: I haven’t been wearing it for over a year for no reason now! LOVE it 🙂 makes me feel bad on lazy days…helps me to set targets for the week as well as just for the day and I find it motivating! Me thinks that Life on the Up – week 2, will be brought to you by Mum… what d’ya say Mum? !